Capsicum (/ˈkæpsɪkəm/), the pepper, is a genus of flowering plants in the nightshade family Solanaceae. Its species are native to the Americas, where they have been cultivated for thousands of years. Following the Columbian Exchange, it has become cultivated worldwide, and it has also become a key element in many cuisines. Additionally, Capsicum species have also been used as medicines and lachrymatory agents. The generic name may come from Latin capsa, meaning 'box', presumably alluding to the pods; or from the Greek word κάπτω kapto, 'to gulp'. The name "pepper" comes from the similarity of piquance (spiciness or "heat") of the flavor to that of black pepper, Piper nigrum, although there is no botanical relationship with it or with Sichuan pepper. The original term, chilli (now chile in Mexico) came from the Nahuatl word chīlli, denoting a larger Capsicum variety cultivated at least since 3000 BC, as evidenced by remains found in pottery from Puebla and Oaxaca. Different varieties were cultivated in South America, where they are known as ajíes (singular ají), from the Quechua term for Capsicum. The fruit (technically berries in the strict botanical sense) of Capsicum plants have a variety of names depending on place and type. The more piquant varieties are commonly called chili peppers, or simply chilis. 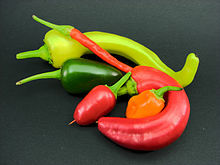 The large, mild form is called bell pepper, or by color or both (green pepper, green bell pepper, red bell pepper, etc.) in North America, sweet pepper or simply pepper in the United Kingdom, Ireland and Malaysia  but typically called capsicum in New Zealand, Australia, South Africa, Singapore, and India. Capsicum fruits of several varieties with commercial value are called by various European-language names in English, such as jalapeño, peperoncini, and peperoncito; many of these are usually sold pickled. Paprika (in English) refers to a powdered spice made of dried Capsicum of several sorts, though in Hungary and some other countries it is the name of the fruit as well. Both whole and powdered chili are frequent ingredients in dishes prepared throughout the world, and characteristic of several cuisine styles, including Mexican, Sichuan (Szechuan) Chinese, Korean, Cajun and Creole, along with most South Asian and derived (e.g. Jamaican) curries. The powdered form is a key ingredient in various commercially prepared foodstuffs, such as pepperoni (a sausage), and chili con carne (a stew), and hot sauces. The plants will tolerate (but do not prefer) temperatures down to 12 °C (54 °F) and they are sensitive to frost. For flowering, Capsicum is a non-photoperiod-sensitive crop. The flowers can self-pollinate. However, at extremely high temperature, 33 to 38 °C (91 to 100 °F), pollen loses viability, and flowers are much less likely to pollinate successfully. An arrangement of chilis, including jalapeno, banana, cayenne, and habanero peppers. Many varieties of the same species can be used in many different ways; for example, C. annuum includes the "bell pepper" variety, which is sold in both its immature green state and its red, yellow, or orange ripe state. This same species has other varieties, as well, such as the Anaheim chiles often used for stuffing, the dried ancho (before being dried it is referred to as a poblano) chile used to make chili powder, the mild-to-hot, ripe jalapeno used to make smoked jalapeno, known as chipotle. In 2013, global production of both green and dried chili pepper was 34.6 million tonnes, with 47% of output coming from China alone. India was the top producer of dry peppers, producing 1.4 million tonnes. Peppers are highly nutritious. They have more Vitamin C than an orange, and a typical bell pepper contains more than 100% of the daily recommended value for Vitamin C. They also have relatively high amounts of Vitamin B6. Fresh fruit is 94% water. Dried pepper fruit has a much different nutritional value due to the dehydration and concentration of vitamins and minerals. Capsicum fruits and peppers can be eaten raw or cooked. Those used in cooking are generally varieties of the C. annuum and C. frutescens species, though a few others are used, as well. They are suitable for stuffing with fillings such as cheese, meat, or rice. They can be preserved in the form of a jam, or by drying, pickling, or freezing. 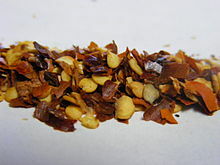 Dried peppers may be reconstituted whole, or processed into flakes or powders. Pickled or marinated peppers are frequently added to sandwiches or salads. Frozen peppers are used in stews, soups, and salsas. Extracts can be made and incorporated into hot sauces. The Spanish conquistadores soon became aware of their culinary properties, and brought them back to Europe, together with cocoa, potatoes, sweet potatoes, tobacco, maize, beans, and turkeys. They also brought it to the Spanish Philippines colonies, whence it spread to Asia. The Portuguese brought them to their African and Asiatic possessions such as India. Spanish cuisine soon benefited from the discovery of chiles in the New World, and it would become very difficult to untangle Spanish cooking from chiles. Ground chiles, or paprika, hot or otherwise, are a key ingredient in chorizo, which is then called picante (if hot chile is added) or dulce (if otherwise). Paprika is also an important ingredient in rice dishes, and plays a definitive role in squid Galician style (polbo á feira). Chopped chiles are used in fish or lamb dishes such as ajoarriero or chilindrón. Pisto is a vegetarian stew with chilies and zucchini as main ingredients. They can also be added, finely chopped, to gazpacho as a garnish. In some regions, bacon is salted and dusted in paprika for preservation. Cheese can also be rubbed with paprika to lend it flavour and colour. Dried round chiles called ñoras are used for arroz a banda. According to Richard Pankhurst, C. frutescens (known as barbaré) was so important to the national cuisine of Ethiopia, at least as early as the 19th century, "that it was cultivated extensively in the warmer areas wherever the soil was suitable." Although it was grown in every province, barbaré was especially extensive in Yejju, "which supplied much of Showa, as well as other neighbouring provinces." He mentions the upper Golima River valley as being almost entirely devoted to the cultivation of this plant, where it was harvested year-round. In 2005, a poll of 2,000 people revealed the pepper to be Britain's fourth-favourite culinary vegetable. In Hungary, sweet yellow peppers – along with tomatoes – are the main ingredient of lecsó. In Bulgaria, South Serbia, and Macedonia, peppers are very popular, too. They can be eaten in salads, like shopska salata; fried and then covered with a dip of tomato paste, onions, garlic, and parsley; or stuffed with a variety of products, such as minced meat and rice, beans, or cottage cheese and eggs. Peppers are also the main ingredient in the traditional tomato and pepper dip lyutenitsa and ajvar. They are in the base of different kinds of pickled vegetables dishes, turshiya. Peppers are also used widely in Italian cuisine, and the hot species are used all around the southern part of Italy as a common spice (sometimes served with olive oil). Capsicum peppers are used in many dishes; they can be cooked by themselves in a variety of ways (roasted, fried, deep-fried) and are a fundamental ingredient for some delicatessen specialities, such as nduja. The Maya and Aztec people of Mesoamerica used Capsicum fruit in cocoa drinks as a flavouring. In New Mexico, there is a capsicum annuum cultivar group called the New Mexico chile pepper which a mainstay of the state's New Mexican cuisine. Only Capsicum frutescens L. and Capsicum annuum L. are Generally recognized as safe. In Polish and in Hungarian, the term papryka and paprika (respectively) is used for all kinds of capsicums (the sweet vegetable, and the hot spicy), as well as for dried and ground spice made from them (named paprika in both U.S. English and Commonwealth English). Also, fruit and spice can be attributed as papryka ostra (hot pepper) or papryka słodka (sweet pepper). In Polish, the term pieprz (pepper) instead means only grains or ground black pepper (incl. the green, white, and red forms), but not capsicum. Sometimes, the hot capsicum spice is also called chilli. Similarly, Hungarian uses the word bors for the black pepper. In Czech and Slovak, the term paprika is too used for all kinds of capsicums. For black pepper, Czech uses pepř, while Slovak uses čierne korenie (literally, black spice) or, dialectally, piepor. In Italy and the Italian- and German-speaking parts of Switzerland, the sweet varieties are called peperone and the hot varieties peperoncino (literally "small pepper"). In Germany, the heatless varieties as well as the spice are called Paprika and the hot types are primarily called Peperoni or Chili while in Austria, Pfefferoni is more common for these; in Dutch, this word is also used exclusively for bell peppers, whereas chilli is reserved for powders, and hot pepper variants are referred to as Spaanse pepers (Spanish peppers). In Switzerland, though, the condiment powder made from capsicum is called Paprika (German language regions) and paprica (French and Italian language region). In French, capsicum is called poivron for sweet varieties and piment for hot ones. Spanish-speaking countries use many different names for the varieties and preparations. 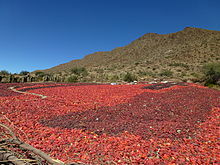 In Mexico, the term chile is used for "hot peppers", while the heatless varieties are called pimiento (the masculine form of the word for pepper, which is pimienta). Several other countries, such as Chile, whose name is unrelated, Perú, Puerto Rico, and Argentina, use ají. In Spain, heatless varieties are called pimiento and hot varieties guindilla. In Argentina and Spain, the variety C. chacoense is commonly known as "putaparió", a slang expression equivalent to "damn it", probably due to its extra-hot flavour. ^ "Capsicum L." Germplasm Resources Information Network. United States Department of Agriculture. 1 September 2009. Retrieved 1 February 2010. ^ a b "Species records of Capsicum". Germplasm Resources Information Network. United States Department of Agriculture. Retrieved 23 June 2010. ^ Oxford English Dictionary, 1st edition, 1888, [http://www.oed.com/view/Entry/27593 s.v. ^ Online Etymology Dictionary, s.v. ^ Quattrocchi, Umberto (2000). CRC World Dictionary of Plant Names. 1, A-C. CRC Press. p. 431. ISBN 978-0-8493-2675-2. ^ Latham, Elizabeth (8 February 2013). "Capsicums at your table". Nelson Mail. Retrieved 19 April 2013. ^ "How to grow chilli pepper / RHS Gardening". ^ "Peppers and chillies/RHS Gardening". ^ a b Walsh, B.M. ; Hoot, S.B. (2001). "Phylogenetic Relationships of Capsicum (Solanaceae) Using DNA Sequences from Two Noncoding Regions: The Chloroplast atpB-rbcL Spacer Region and Nuclear waxy Introns". International Journal of Plant Sciences. 162 (6): 1409–1418. doi:10.1086/323273. Archived from the original (– Scholar search) on 12 December 2012. Retrieved 20 December 2007. ^ Heiser Jr, C.B. ; Pickersgill, B. (1969). "Names for the Cultivated Capsicum Species (Solanaceae)". Taxon. 18 (3): 277–283. doi:10.2307/1218828. JSTOR 1218828. ^ Tewksbury, J.J.; Manchego, C.; Haak, D.C.; Levey, D.J. (2006). "Where did the Chili Get its Spice? Biogeography of Capsaicinoid Production in Ancestral Wild Chili Species" (PDF). Journal of Chemical Ecology. 32 (3): 547–564. doi:10.1007/s10886-005-9017-4. PMID 16572297. Retrieved 20 December 2007. ^ Eshbaugh, W.H. (1970). "A Biosystematic and Evolutionary Study of Capsicum baccatum (Solanaceae)". Brittonia. 22 (1): 31–43. doi:10.2307/2805720. JSTOR 2805720. ^ a b Ballard, R.E. ; McClure, J.W. ; Eshbaugh, W.H. ; Wilson, K.G. (1970). "A Chemosystematic Study of Selected Taxa of Capsicum". American Journal of Botany. 57 (2): 225–233. doi:10.2307/2440517. JSTOR 2440517. ^ Pickersgill, B. (1971). "Relationships Between Weedy and Cultivated Forms in Some Species of Chili Peppers (Genus capsicum)". Evolution. 25 (4): 683–691. doi:10.2307/2406949. JSTOR 2406949. PMID 28564789. ^ Eshbaugh, W.H. (1975). "Genetic and Biochemical Systematic Studies of Chili Peppers (Capsicum-Solanaceae)". Bulletin of the Torrey Botanical Club. 102 (6): 396–403. doi:10.2307/2484766. JSTOR 2484766. ^ van Zonneveld M, Ramirez M, Williams D, Petz M, Meckelmann S, Avila T, Bejarano C, Rios L, Jäger M, Libreros D, Amaya K, Scheldeman X (2015). "Screening genetic resources of Capsicum peppers in their primary center of diversity in Bolivia and Peru". PLoS ONE. 10 (9): e0134663. doi:10.1371/journal.pone.0134663. PMC 4581705. PMID 26402618. ^ Zamski, E.; Shoham, O.; Palevitch, D.; Levy, A. (1987). "Ultrastructure of Capsaicinoid-Secreting Cells in Pungent and Nonpungent Red Pepper (Capsicum annuum L.) Cultivars". Botanical Gazette. 148 (1): 1–6. doi:10.1086/337620. JSTOR 2995376. ^ Stewart Jr, C.; Mazourek, M.; Stellari, G.M. ; O'Connell, M.; Jahn, M. (2007). "Genetic control of pungency in C. chinense via the Pun1 locus". Journal of Experimental Botany. 58 (5): 979–91. doi:10.1093/jxb/erl243. PMID 17339653. ^ Deyuan Yang; Paul W. Bosland. "The Genes of Capsicum" (PDF). HortScience. ^ Kim, Seungill; Park, Minkyu; Yeom, Seon-In; Kim, Yong-Min; Lee, Je Min; Lee, Hyun-Ah; Seo, Eunyoung; Choi, Jaeyoung; Cheong, Kyeongchae (1 March 2014). "Genome sequence of the hot pepper provides insights into the evolution of pungency in Capsicum species". Nature Genetics. 46 (3): 270–278. doi:10.1038/ng.2877. ISSN 1061-4036. PMID 24441736. ^ Institute, The Chile Pepper. "NMSU Cultivars - The Chile Pepper Institute". www.chilepepperinstitute.org. Retrieved 28 January 2016. ^ a b "FAOSTAT". faostat3.fao.org. Retrieved 7 April 2016. ^ Mason, J. R.; N. J. Bean; P. S. Shah; L. Clark Shah (December 1991). "Taxon-specific differences in responsiveness to capsaicin and several analogues: Correlates between chemical structure and behavioral aversiveness". Journal of Chemical Ecology. 17 (12): 2539–2551. doi:10.1007/BF00994601. PMID 24258646. ^ Norman, D. M.; J. R. Mason; L. Clark (1992). "Capsaicin effects on consumption of food by Cedar Waxwings and House Finches" (PDF). The Wilson Journal of Ornithology. 104 (3): 549–551. JSTOR 4163197. ^ "Active Ingredient Fact Sheets" (PDF). npic.orst.edu. ^ "The Scoville Scale of Hotness - Capsaicin Level". Chiliwonders.com. Archived from the original on 29 August 2013. Retrieved 27 November 2013. ^ "The World's Healthies Foods". Retrieved 23 February 2010. ^ "Giant Marconi Pepper: Smoky Sweet Flavor, Large Fruit". ^ "- Jimmy Nardello's Pepper". www.territorialseed.com. 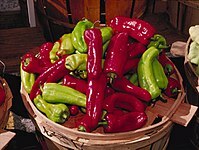 ^ "Italian Frying peppers - Produce Express of Sacramento, California". produceexpress.net. ^ "Capsaicin as an Insecticide". ^ "Ask Garden - Simple Gardening Tips". Ask Garden. ^ Pankhurst, Richard (1968). Economic History of Ethiopia. Addis Ababa: Haile Selassie I University Press. pp. 193–194. ^ Wainwright, Martin (23 May 2005). "Onions come top for British palates". The Guardian. London. Retrieved 30 October 2007. ^ Unknown, Unknown. "Sri Lankan Cuisine". SBS Food. SBS. Retrieved 7 May 2011. ^ Mitzewich, John. "10 Foods America Gave to the World". About.com Food Guide. About.com. Retrieved 7 May 2011. ^ "Slovník slovenského jazyka z r. 1959 – 1968". Jazykovedný ústav Ľ. Štúra SAV. Wikisource has the text of the 1911 Encyclopædia Britannica article Capsicum.